I was there for the Planning Institute of Australia Congress 2017, and kept passing this work on my way to conference. Such high quality and so detailed. I did wonder where the water pipes and wastewater pipes were - of course - as you do. You can see it's made of reinforced concrete. Various layers. You can see the light rail tracks on top. And you can see the provision for signalling, cables, and conduits for Africa. 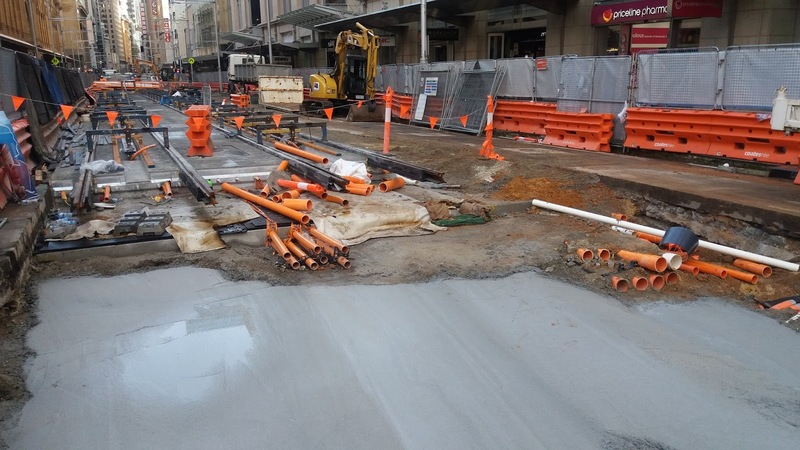 Nobody talked about this stuff at conference, but this infrastructure work has an appearance of durability and quality about it that I've not seen anywhere in New Zealand. You can see a well put together concept design for the overall project here. Interestingly, the area in the image looks a bit like how Auckland's QEII Square could have looked had the extra space not been sold off. Other downloads relating to the planning and activation of this important part of downtown Sydney can be seen here. Hosking (NZ Herald Opinion 11 May 2017) justifies permanent annual immigration inflows of 70,000 because “half are New Zealanders and Australians” and because they are needed to fill job vacancies. However his accompanying economic analysis misses the mark because he ignores two other inflows which are essential to an understanding of the nation’s simmering discontent. The first inflow he ignores are the 200,000 people who were issued temporary work visas in the year ending June 2016 - almost 30,000 more than the year before. While individual workers and students may come and go, the temporary overall resident population level has increased sharply putting further pressure on accommodation and transport infrastructure. Just because these guys are designated "temporary" doesn't mean they don't - as a whole - have similar demands as "permanent" immigrant. 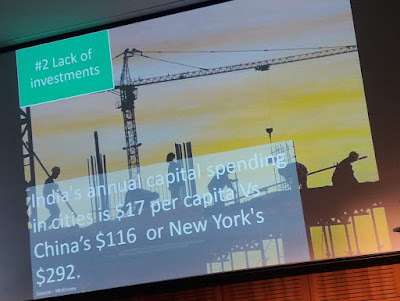 The second inflow which must be factored into any analysis of NZ’s changing economy is the unprecedented investment level of foreign capital finding safe haven in our relatively unregulated property market. Immigration and foreign capital go together. Their combination is transforming cities like Brisbane, Vancouver, Sydney and Melbourne. And Auckland. The differences lie in how these different countries are responding. 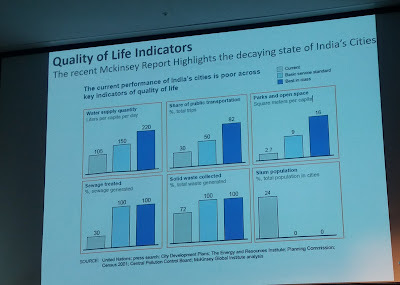 The pent up demand for what these cities offer (including safety, security, high quality education, health services etc) among the burgeoning middle classes of India and China in particular is enormous. Even suggesting this demand can be met by increasing supply (of houses for example) is ridiculous. The pattern of NZ's immigration has changed as the world's wealth distribution has changed. Immigration from UK and Australia is steady, but actual demand from India and China has risen sharply and potential demand from those countries is gigantic. What can’t and shouldn’t be ignored are the social consequences of a combination of unprecedented and sharp annual increases in NZ’s actual population and of unregulated foreign investment in property. This unmanaged combination might be good for the national economy and the property industry, but comes at a considerable cost to resident communities. Even Hosking might concede that. Prathima Manohar is the Founder of the think do-tank on livable cities “The Urban Vision” and is the co-Founder of the Urban innovation Incubator, “Urban Venture Labs”. Prathima holds a bachelors degree in Architecture. 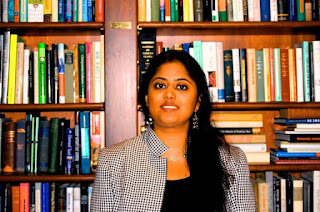 She was awarded Stanford University’s prestigious Draper Hills Fellowship bestowed to rising international stars who work on issues related to Democracy and Development in 2011. As an urbanist, she has worked on projects and researched on issues such as place making, affordable housing, participatory planning and green cities. Mumbai and Bangalore are cities she talks about. She has been a contributing columnist on architecture, urban development and design with India’s Leading News daily – The Times of India. She was among Global Honourees of 2009 CONSIUSA’s “Young Leaders Program” which recognizes emerging leaders under the age of 40, who have distinguished themselves and have demonstrated leadership qualities and potential in various careers. 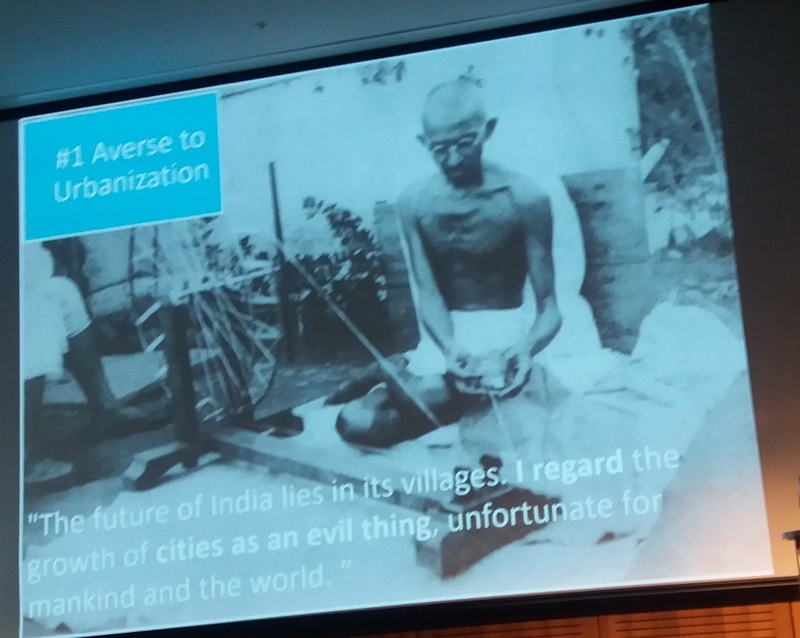 In many ways the social, economic and environmental future of our world is going to depend on the transition of an “India of villages “into an “India of cities”. This is a momentous time in India with an unparalleled level of focus on urban infrastructure and city development. Prime minister Modi has been using the strategy often called “Urban Renaissance” as a central theme for a wide array of economic and social reforms.This panel will highlight the major plans from building 100 Smart cities, The Urban Revival program- AMRUT, Make in India and Real Estate Regulatory Authority. Can these plans lead to structural transformation of India's built environment industry and the wider economy? The session will discuss the state of India Cities at the moment and highlight grass root level innovations towards building livable and inclusive cities. Prathima's presentation contained advice and findings from various international studies, to underpin her main recommendations about the planning issues that need to be confronted. Quality of Life indicators included the basics. Cities in India are playing catchup to Western standards of water and wastewater services, but up there, with those services, is the provision of parks and open space, and access to public transport. Like most fast growing cities, India has challenges with infrastructure investment, and who pays. 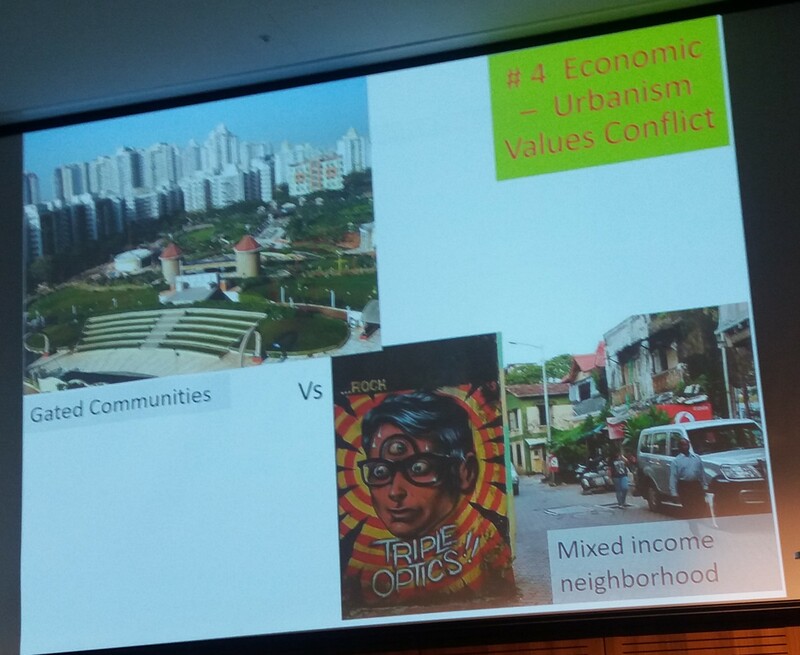 There was a lot more on this topic, but I have chosen for this post, her 4 urban values conflict slides. These may encapsulate the political economy of urban planning in India, but they are just as true in Auckland. 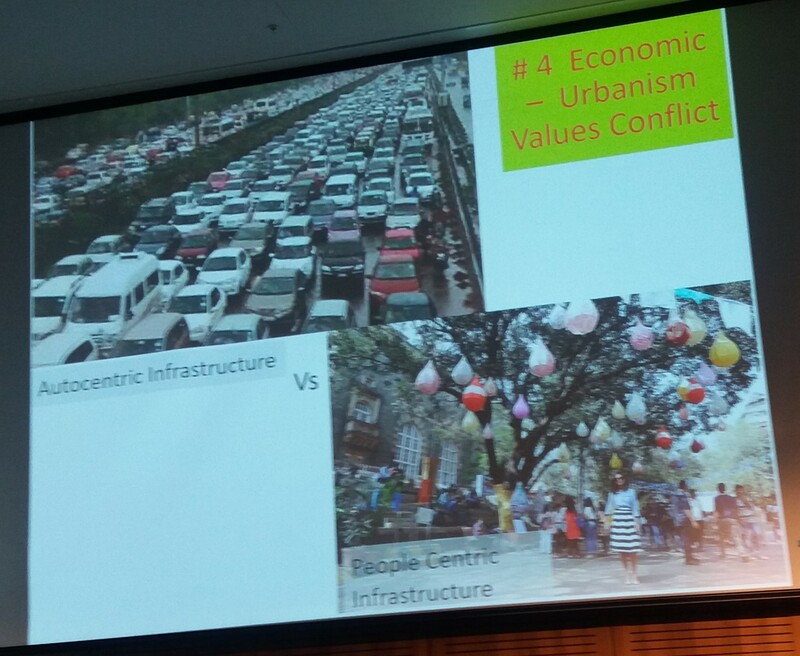 Autocentric infrastructure Vs People Centric Infrastructure. The debate is not about cars vs public transport. It is about public roading space vs public people space. We haven't engaged with that dichotomy in Auckland. Deemed surplus public land or reserve land is being sold by Auckland Council for urban development. Some is also taken for roading projects. Places for people is the catch cry here. Problem is, the car is still king. Look at AT's main list of capital works, and NZ Transport Agency's focus on its State Highway "ladder rung" severing Onehunga. Retirement Villages and other medium scale residential projects existing and proposed within Auckland's built environment, are planned separate developments. They might not all be ringed with moats and security fences, but they generally do not inter-relate with the surrounding urban environment whose residents can feel unwelcome. Given the option most investors will go for a gated community design - easier to build, easy to sell, new residents quit like security, seclusion and privacy. For a while anyway, until the isolation and limited access to amenity begins to pall. If we only rely on market forces to make these kinds of planning decisions then we should not be surprised how Auckland's redeveloped urban landscape turns out. 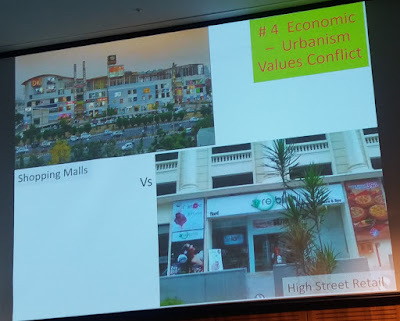 Shopping Malls with global brands Vs local street retail and shopping. Auckland has been happy to provide malls throughout the region - often at the expense of high street shopping. We all drive to them. Part of the autocentric equation. I wrote a little about this here a few weeks ago. Global branding needs a mall at least to display its signage and locate. We probably need both configurations - but the balance in Auckland is very different from the balance in Wellington (for example). Auckland might not have the same history as India, but we do have a history and we are home to the world's largest Polynesian population. We have an indigenous culture. Maori. But you wouldn't really know that walking in downtown Auckland and its waterfront. Again, very different from Wellington. 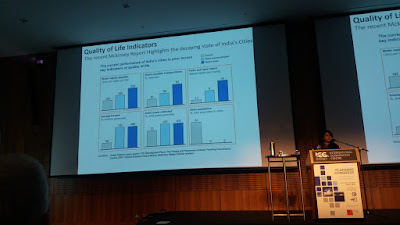 Research that was triggered from attending the PIA Congress drew me to explore measureable urban indicators specifying the delivery of minimum public good outcomes. I came across ISO 37120:2014 (Sustainable development of communities – Indicators for city services and quality of life), these contain, for example, measures we already know about like: square metres of public recreation space per capita; number of public transport trips per capita; green area per capita; the jobs/housing ratio. While it might appear to Auckland Council, and to its Councillors, that Auckland's future urban form is finalised, and that the planning systems that are in place to deliver it are also finalised - with only a little bit of reflection you come to the conclusion that that's not good enough. 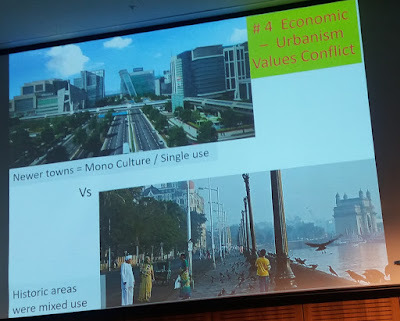 Prathima remarked that what is happening to cities India, as their populations exert more and more democratic influence over urban outcomes - engaging with the urban values conflicts outlined above - they will be the shapers of global urban futures. They are going where we have yet to go. Better to engage with these really big conflicts sooner than later - and properly. The story that I've told so far began with the Sept 27, 2016 posting Rymans Crams Reitirees into Devonport, and continued with the 18 Jan, 2017 posting First Test of Unitary Plan: Rymans Granted. This decision was appealed by the specially formed Devonport Peninsula Precinct Society. This group had morphed from the resident group that established initially to engage with the urgent submission and hearing process precipitated by the original Ryman's application, the fact considerations by Auckland Council's Urban Design Panel were not taken into consideration by Rymans, and the typically short time available for residents to get organised. The work involved in bringing an appeal like this, of building relationships with local architects, expert urban design witnesses, and planners, of identifying legal advocates and fund-raising to get an effective team mobilised is one thing. Quite another is the immense work of capacity and knowledge building that is needed within the local community, when a project of this scale and impact threatens local amenity and quality of life. A residents’ group’s appeal against Ryman Healthcare’s plans to build a huge retirement village in Devonport is over, subject to Environment Court approval. All of the 300-strong Devonport Peninsula Precinct Society’s (DPPS) issues were satisfactorily resolved by Ryman in a court-led mediation process that lasted over a month. The society lodged an appeal to the Environment Court in February 2017 after Auckland Council gave consent to Ryman for its six storey, 600 bed, 300 car park facility in Devonport. The group cited poor design and unsuitable bulk in its appeal. DPPS chair Iain Rea says that within the constraints of an appeal to an already consented development, the society was pleased with the result. “We are still going to have Devonport’s biggest ever development on this site, but we have managed to mitigate some of the worst effects,” he says. Subsequent appellants to the appeal were the New Zealand Institute of Architects Auckland Branch and civic lobby group Urban Auckland whose support proved the gravity of the case. “All three groups took this case extremely seriously and Ryman fully engaged in mediation” says Rea. “And the result sends a clear a message to the council that the approval under the Unitary Plan of Ryman’s initial plans was wrong. Ryman had absolutely no incentive to come to the table with good design. They didn’t have to, council approved exactly what they proposed”. The intensive development of five other precincts on the Devonport peninsula is afoot, and while the society fully understands and appreciates the implications of a growing population that includes an elderly population bulge, loose planning controls that allow poor quality design and inappropriate development to proliferate will be under scrutiny. It remains a gated community - this is despite changes internationally and here in New Zealand where retirement communities are a much more integrated part of the urban environment - offering retirement lifestyle choices which are part of the wider community, rather than apart from it. There is still water to flow under the bridge with this project, and hopefully Rymans will consider carefully what has happened, not least because I understand Rymans have purchased a development site at Hobsonville Point. The Hobsonville Land Development Company will want the best design to compliment what has already been achieved there, and won't support the rough and ready and rather careless approach that Rymans have demonstrated in Devonport. But they did what they did in Devonport because they could. Good planning provides for local aspirations and takes a collaborative approach. This did not happen here, and the responsibility for that rests firmly with Auckland Council. No amount of subsequent urban design sticking plaster will cure the fundamental failures that this episode exposes in Council's systems for handling applications that will result in urban intensification. Few existing communities have the oversight and protection of something like the Hobsonville Land Development Company to maintain and ensure implementation of a coherent vision and spatial plan and gradual creation of interlinking and complete communities. Foreshadowed Urban Development Authorities could improve the planning situation - but this is unlikely if their main purpose is to accelerate and streamline intensive residential development. Some might criticise me for too fondly remembering the past. But I rue the day that Devonport lost its local community board, and their role in assessing resource consent applications. Their knowledge of local communities and local geography were regularly applied to improve outcomes and to effectively integrate new buildings and developments into existing environments. That sort of planning work was abolished with amalgamation. But it could be re-introduced. Local Boards could be delegated roles and responsibilities in local planning. At the very least this would provide checks and balances and would re-introduce collaborative approaches to planning, and allow for the expression and influence of local aspirations. Urban designers and urban design panels are no substitute for this planning. Auckland Council's Unitary Plan provides for intensification. However the absence of planning around implementation which incorporates local aspirations and takes a collaborative approach will, in future, inevitably lead to the construction of more gated and separate urban enclaves in Auckland - because that will be the easy option for developers. And they will be resisted by local communities, just as the Devonport Rymans project has been, putting people through the cost and pain of appealing, mediation and environment court proceedings. There is a better way.